Quneitra, SANA-citizens of the occupied Syrian Golan affirmed their rejection of all racial practices perpetrated by the Israeli occupation authorities that aim to loot and confiscate the lands of Syrian citizens, substitute their properties and real-estate documents of the villages of Majdal Shams, Baka’ata, Ayn Qenia, Mas’ada and al-Ghagar in the occupied Golan. A number of Golan citizens, affirmed in telephone calls with SANA reporter in Quneitra, that the Israeli occupation policy aims at confiscating and looting the lands which are owned by citizens of Golan under fake pretexts. 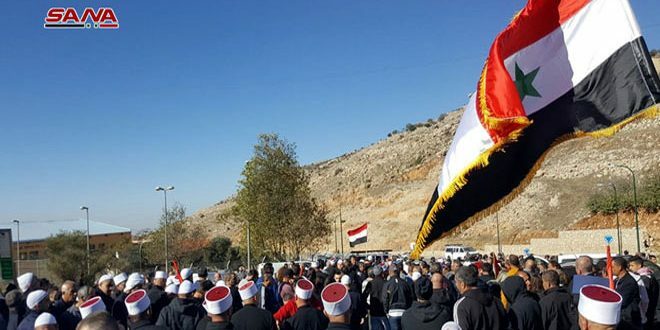 Sheikh Suleiman al-Maqt, from Majdal Shams, said that the occupation authorities behave in a racial way against the history and territory of the occupied Golan. He added that the lands of Golan citizens have registrations and the proof of their property in the Syrian real-estate documents and the Syrian state has the only right in any disposal of these properties. “The property of the occupied lands are red line and the Zionist entity has no right to change the nature or history of Golan lands,” al-Maqt said. For his part, Marzouk Sha’alan, from Ayn Qenia, stressed that the so-called Israeli Survey bureau has started the works of survey in a number of sites and lands of citizens in the village to submit documents and property papers of their lands inherited from their parents and ancestors. “In case the families were not able to submit those documents, the occupation authorities would confiscate the lands from their real owners,” Sha’lan said. The Israeli occupation authorities have lately started works of surveying the lands owned by Syrian citizens who have no papers to exert pressures on them to accept documents of property issued by the so-called “Israeli Survey registration bureau,” or their lands would be confiscated.